Following the bruising battle in the European Parliament, the revision of the EU Directive on animal experiments moved to the Council of Ministers, and dialogue between that body, the European Commission and the European Parliament – the toughest and least transparent stage of the process. Nevertheless we were there, lobbying, generating publicity and interest, pushing for amendments, and mobilising supporters. This phase of the campaign proved perhaps the most difficult. Whilst in the European Parliament amendments are tabled and debated openly, the Council of Ministers remains essentially a diplomatic body and debate takes place behind closed doors. Thus, representatives and experts from the Council who take decisions affecting millions of animals are not obliged to inform us which Member States are supporting what measures. Before discussion began our team was heading across Europe for meetings with most of the Council advisors involved in the Directive, as well as the Swedish European Presidency. We created awareness and involved the public in the process as much as possible, for example with Save the Primates campaign launches in Spain, Italy and Belgium, postcard campaigns in the UK, and galvanising public responses to the Home Office consultation. Online, we encouraged supporters from all over Europe to sign a letter of key demands. It was important to be aware of the process; a draft had been presented by the Commission, this had been amended and agreed by the European Parliament, it was not therefore possible to take the text in a different direction. Our letter therefore specifically supported or opposed measures that had been supported by either the Commission or Parliament. 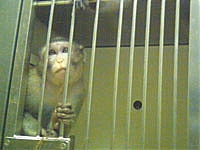 This was handed in with over 10,000 signatures - one person for every monkey experimented on in the EU that year. Our thanks to everyone who helped collect signatures. The House of Lords’ opinion on the new EU Directive on animal testing – to which we gave evidence agreed that strict EU regulation is needed, particularly for primates, and that it was urgent to promote non-animal methods. We were pleased to see that our evidence had proved influential. The Council maintains a permanent dialogue with selected MEPs who act as spokespersons for the European Parliament and report back to their Political groups. With the help of these MEPs, and in particular Jill Evans and Daciana Octavia Sârbu, shadow rapporteurs for the Green/EFA and Socialists and Democrat groups, we contributed to shape the “trialogue” between the European Commission, the Swedish Presidency and the Parliament. ADI and Eurogroup for Animals produced a series of key briefings to inform representatives. These included background and amendments on: Development of alternatives; wild capture of primates; authorisation processes; thematic review; replacing animal experiments. Often we would be responding to discussions and proposed text changes from the previous few hours and would work into the night to finalise vital briefings. In November, during the first week of trialogue meetings, we held a discussion of the Directive and screening of ‘Save the Primates’ in the European Parliament. This was chaired by Spanish Green MEP Raul Romeva and addressed by rapporteur Daciana Sârbu MEP, and Tim Phillips of ADI. These efforts were rewarded to some extent. Indeed, some of the most damaging amendments voted in the European Parliament in May 2009 (as reported in Animal Defender Spring/Summer 2009) were scrapped or changed by the Council. For instance, the EP’s amendment to replace the procedure of authorisation for all mild experiments by a simple notification was changed. The Council agreed on an authorisation procedure for all animal experiments. The phase-out on the use of wild-caught primates in breeding was maintained, against the European Parliament report and industry wishes. The restriction of the use of primates for research to debilitating and life-threatening diseases stayed – although a clearer restriction is needed. Welfare standards were introduced for fish, which were initially forgotten by both the Commission and the European Parliament. Our proposals on thematic review, adopted by the Parliament, were softened but not removed. However, a few Member States also took advantage of the notoriously undemocratic ways of the Council to make some shameful suggestions. For instance, an amendment was tabled so that no Member States would be allowed to apply stricter animal welfare measures than those provided by the Directive. This amendment would effectively freeze progress in Europe for decades and prevent countries from democratically adopting innovative legislation to limit animal testing. Our protests were backed by Member States, such as Finland and the Netherlands, and the article was changed to allow stricter existing national legislation. However, this doesn’t apply to future legislation, and we are still asking for this to be corrected. Some other worrying amendments weakened the Member States’ duties to promote alternatives. For instance, the duty for Member States to create National Reference Laboratories for the validation of alternatives was changed to a vague commitment to ‘assist’ and ‘contribute’ to the development and validation of alternative approaches. This lack of vision is very disappointing, and it appears from our meetings with the Home Office that the UK has no plan to designate a laboratory to develop and validate alternatives. Trialogue ended in April 2010 and the final compromise text will be voted on by MEPs in Plenary soon. Although we will press for improvement where possible, opportunities to make big steps forward are now limited at the EU level, because all decision-makers now want to conclude this long legislative process. This has been a huge campaign for us over the past eight years, most intensely in the last six. But this is not the end: next the Directive will have to be transposed in the laws of 27 Member States, including the UK. Now we must prepare for that challenge.